Schedule 40 PVC pipe, abbreviated "Sch 40", has thicker walls than standard PVC. Schedule 40 PVC will be stronger and resist bowing better. While we've built simple light supports with 1/2" outer diameter (OD) Sch 40 PVC, we recommend at least using 3/4" OD Sch 40 PVC, with 1" OD being even stronger and safer especially for tiered plant stands and benches. PVC is a good material for plant applications because it will not be affected by light and moisture. It is also easy and mess-free to cut, lightweight, and inexpensive. 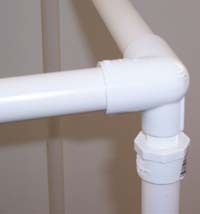 Ten foot lengths of 3/4" Sch 40 PVC are about $2-3, and fittings are less than a dollar each. For permanent structures, use PVC cement to bond the pieces together. For temporary structures, simply push the components together until tight (will not be as strong as cemented junctions!). PVC can also be primed then painted if desired. We use these contraptions to hold lights above our orchids. For information on orchid culture, see our orchid culture information. They can certainly be used for other houseplants and starting seeds with little or no modification. One thing you'll need to consider before starting is the height you'll need. Consider how high the plant trays or humidity trays will hold the plants above the surface you'll be putting the light stand on and the lost space from the shop lights. We usually use humidity trays and put something to hold the humidity trays above the floor or table to prevent mold growth under the trays. Somewhere between 24 and 36 inches is plenty. Less will be fine if you'll be using the light stand to start veggie or herb seeds. Remember, you can always cut more off the PVC to make it shorter OR lower the lights closer to the plants by changing the chain height. Thirty inches is a good height for us. The instructions below are all for 2' by 4' growing areas with about a 30" height. Adjust to your needs as desired. This is a quick way to build legs to suspend fluorescent shop lights above plants. It was initially intended to be easy to put up and take down and to be used with four foot shop lights over a two foot by four foot growing area. This model is nice if you don't know how far apart the chains will be on the shop lights to be used because the distance between the top supports is adjustable by simply moving the legs. This version usually can't be covered in plastic to retain humidity since the lights will probably stick out past the leg frames, and it is not as sturdy as other models. You'll need: 3/4"-1" Sch 40 PVC, eight slip end caps, four 90 degree slip fittings, and four slip T fittings. Cut two 24" lengths of PVC as the top braces. Cut four 30" PVC lengths as the legs. Cut four 12" and four 9" lengths as the feet. Assemble with longer feet facing in (the hanging lights will tend to bring the legs together). End caps on the feet will keep them fairly flat on the table or floor. Use zip ties or twist ties to hold the chains to the top braces (chains are usually supplied with the shop lights). If you want a little more sturdiness, add one or two supports of appropriate length between the legs across the top (parallel to the shop lights). We made these as light stands, but the same design can be used to make greenhouse benches. You'll need: 3/4"-1" Sch 40 PVC, four slip T fittings, four three-way slip fittings. We had a hard time finding three-way slip fittings at our local hardware stores, but were able to rig them up with two-way slip by one way female thread fittings by adding a slip to male thread adapter as shown- be creative! We found 24" square, 3" deep sturdy plastic trays at Farm and Fleet. They are intended as animal cage under pans and are made by Havaheart. Two feet by four feet trays are around, but are much more expensive than a stack of these. We built this stand around these trays.